How do I collect seed from my poppy? 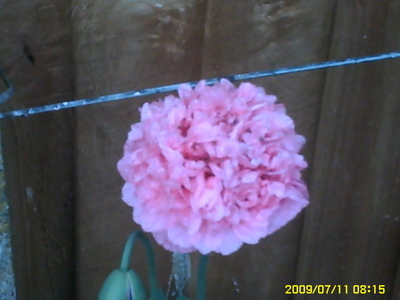 This poppy self seeded in my back garden (the veggie garden) and I want to put it in the front. How do I collect the seeds and when should I sow them?? I have just put a comprehensive answer to Mookins query re seed collection on~should answer your question. Once you've got your seeds, the next step is to sow them. How, when and where you sow your seeds will depend on many things - the type of seeds, how many of them you have, how many plants you want to end up with, what your growing conditions are, and, to some extent, what's considered normal in your area. This page tells you how I sow my seeds, gives you more general information about seed sowing, when's the usual time to sow, details of winter sowing and sowing seed in paper towels, the basic rules for success, and some Frequently Asked Questions and Links to sites with more information on seed sowing. I sow all my seeds in small square plastic pots, in a compost of 50/50 loam-based John Innes No. 2 and a peat-based multi-purpose compost. 15 of these pots fit in a standard seed tray. When I sow seeds outside, I put the trays in a 3-shelf stand with an open front, but covered at the back and sides. After the seeds have germinated, I move the pot to an unheated greenhouse until the seedlings are big enough to transplant. When I sow seeds inside, I stand the tray on the work surface in the kitchen or in my conservatory, and I put a plastic cover on. When the seeds have germinated, I move the pot to the conservatory or the greenhouse, and leave it uncovered. When I sow seeds in the Propagator, I put the pots in a seed tray that has a heated element in the bottom as well as a plastic cover. Sometimes, in the winter, if the Propagator is full, I stand the covered seed tray on top of the boiler, which also provides bottom heat. When I sow seeds by the Deno method, I put the seeds between damp folded paper towel, put inside a loosely folded plastic bag, which I keep beside the boiler in the kitchen. When the seeds have germinated, I put them in a small pot and move them to the conservatory or the greenhouse. I only sow small quantities of seed - I am only looking for one or two plants, from which I can propagate more if I want them. Some seeds germinate better if the seed coat is nicked. I use a pair of nail clippers to make a small hole in the middle of the seedcoat. Some seeds benefit from being soaked before sowing. I usually use hot water and only soak for an hour or two. I find seeds sometimes rot when they have been left to soak for a long period - except Canna, which I find germinate better after being soaked for two days. I do not use growlights, and I do not sow seeds in the fridge or use artificial methods of stratification. If my seeds need a cold period to induce germination, I sow them outside in the autumn/winter. I do not use vinegar, orange juice, washing-up liquid, alcohol or any other substances to soak my seeds. If I soak them, I use water. This simply means sowing your seeds where they are to flower. You can either sow them broadcast or in drills or rows. Sowing them broadcast means scattering them on the surface, and sowing in drills means sowing them in rows. Sowing them broadcast is a good method for sowing seeds of annuals where you have plenty of seed and want a good patch of colour. It's particularly appropriate for a mixture of types or colours. Sowing in drills or rows is good where you still want a lot of plants, but prefer to have each type in its own row. Before sowing the seeds, you need to prepare the ground. You need to dig it to make sure there are no large lumps of soil or stones, and then rake over the surface to give a fine 'tilth' - a smooth surface with the soil broken down into small particles. To sow seeds broadcast, simply scatter them over the surface, rake them in gently, and water the ground carefully. To sow in drills, dig over the soil, rake it, then mark out rows with a stick or the back of a hoe. Sow the seeds in the rows, then cover by raking the soil from the side of the row over the drill. Again, water gently. Small seeds are usually sprinkled evenly along the row, large seeds - like peas or beans - are usually sown singly a few inches apart. If the seedlings come up too thickly to allow the plants room to grow properly, you will need to thin them out by removing the unwanted seedlings. Remember that seeds sown outside in the garden will need weeding, and you need to keep an eye out for damage by snails, slugs, caterpillars, birds and cats. Seeds can be sown in seed trays (called 'flats' in the US), either outside or in a cold frame or greenhouse. Fill the tray with compost - use whatever is easiest to obtain in your area, as most brands will work - and firm gently. Either sow the seed broadcast, in rows, or singly, depending on their size. Cover lightly - about the same depth of compost as the width of the seed is the traditional rule. I like to water the compost before sowing the seeds to prevent them being washed out of place, but you can water them carefully after sowing if you prefer. Some seeds need to be kept dark, some need light. I usually leave small seeds uncovered and poke large ones into the compost with my finger. If they don't germinate, I stir the compost with the label, which moves the seeds that were covered into the light and those that were uncovered into the dark. You may prefer to be more methodical and cover the seed tray with a newspaper. You can also cover it with a sheet of glass to prevent it drying out. Because you are using compost, nothing should come up in the seed tray except the seeds you sowed. This is a cross between sowing in seed trays and sowing in individual pots. Cell packs are plastic trays which either fit into seed trays or can be used on their own. They provide an individual cell for each seed (or group of seeds for small seeds). Sow seeds as for seed trays. Seed trays are fine if you want large numbers of plants, or if you have plenty of seed. If you are sowing a small number of seeds, particularly if they are difficult to obtain, you might prefer to sow them in separate pots for each variety. The size of pot will depend on how many seeds you have, the size of the plant, how fast it grows, and when you intend to pot up the seedlings. I use plastic pots about two and a half inches square, because 15 individual pots fit into a standard sized seed tray. For large seeds - those of trees or shrubs, for example - giving each seed its own pot will save having to disturb the seedling until it is fairly well established. For small seeds giving small seedlings, having them in a pot of their own means you can keep an eye on them easily and they won't be overlooked, as they might be in a large seed tray. Fill the pot with compost - you can afford to provide a different mix of ingredients more suited to the individual plants if they have their own pot (adding more grit for alpines, for example). Firm it gently, water, then sow the seed, covering or not as appropriate. Some people like to add sand, grit or vermiculite as a top dressing. Sowing seed in individual pots makes it easier to give each type of seed the appropriate care - moving them when they have germinated, for example, or keeping them in a frame if they are expected to take more than one season to germinate. My garden was entirely vegetables until about a month ago when I was co-ursed by certain members of this site, who shall remain nameless (Spritzhenry, Jacque, Lily2 You know who you are !! Mookins) into delving into the strange world that is flower growing. Small words, spoken softly with love and care are what are required here. how do I collect the seed? When do I collect the seed? How do I store the seed? And finally when do I sow the seed? I think its a case of killing two birds > judging by the pic,after it has flowered you wait until the pods have almost dried out REMEMBER your looking for a dark/brown seed inside, its difficult to judge too soon & the seed will be white & leave it too late & the pod will be empty > now theres two things you can do....the flowering head in the pic,you could take the seed from that flower & sprinkle them round the front,hopefully theres still enough summer left. BUT the one that has"nt flowered yet,you can take the seed from that & store them somewhere dry like your shed until next year, until normally when you see bluebells flowering or when you put your early spuds in......its all about ground tempreture. Ian, blow for blow, let the heads dry off and become brown. Cut the whole pod off in September, store as they are in a dry place. Break open the pods in March. Sprinkle the seeds where you wish them to grow. Thin out if too thick then enjoy the rest. Guilty as charged Ian!! Now that I see the open poppy in all it's glory I KNOW I was right and can see why you succumbed so easily to its pretty face. (You men are all the same) :~)You really are smitten aren't you, now you want to have babies with it...!! I really can't understand how you didn't immediately digest all of Arlene's words of wisdom. Do try to keep up, it's only flowers not complicated veggie stuff. Sorry if I gave you too much information. In time it might be useful! Keeping a little eye on seedlings indoors..